The Hornets swarmed into the Cougar Dome and came out with a W. They look to begin their dominance of 3A as they head to Rockville. -Jason H-B. Markus Vinson is an elite player. He carried the load for the Hornets in their win over QO and will be relied on heavily the remainder of the year. -Matt M.
Lost to possibly the best team in the state by only 8 points without two of their most prominent weapons. Nothing to hang their heads over at all. I feel bad for the Wildcats of Walter Johnson as they have to host some angry Cougars this week. -Jason H-B. The Cougars hung tough with one of the best teams in the state even though they were missing some of their best players. I still expect QO to be the 1 seed in the 4a west which is why I still have them ranked highly. -Matt M.
Went to Poolesville and dominated as expected. The real test comes this week as they host the Jaguars. This years Battle for the King's Trophy should not disappoint. -Jason H-B. Don't be fooled by their small roster. The Screamin Eagles still have plenty of talent and can compete with anyone. 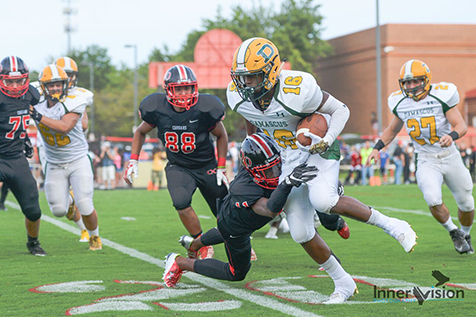 -Matt M.
The Jaguars took some time to get the ball rolling on Gaithersburg last week, but they can't do that as they head to Death Valley and battle the Screamin' Eagles. This game is always a great indication of how good either team really is and I expect nothing different from this year. -Jason H-B. Its hard to replace the likes of 3 year starter Mark Pierce but the Jags will need to find more offense than they had against Gaithersburg if they want to win the Kings Trophy next week. -Matt M.
The Warriors didn't impress too many folks with their performance last week, but they came out with the W, which is huge with their biggest playoff competitor for Moco (Paint Branch) took an L. Look for Sherwood to come out tougher as they host a motivated Clarksburg this week. -Jason H-B. Struggled against BCC but won the game. It doesn't get any easier as the Warriors welcome Clarksburg to Sandy Spring in week 2. Let's see what they're made of. -Matt M.
The Blazers have steadily improved over the last few years. Are the Blazers for real? We'll find out in week 2 as Blair takes on a tough BCC Barons squad which nearly beat Sherwood. -Matt M.
I've been big on Coach Fields' kids, but they've yet to pull off the big victory to solidify their spot. Their opportunity won't come just yet this week, but they better not over look the Barons of B-CC, who brought it to the Warriors last week. And to humor message board member, "fallen" HM: Blake - Made light work of Springbrook and making some noise on the Board. Definitely have a great opportunity to make a name for themselves this week as they are going to face a Paint Branch team who is on the brink of playoff elimination and don't want to start 0-2 like the 2007 Michigan Wolverines. -Jason H-B.